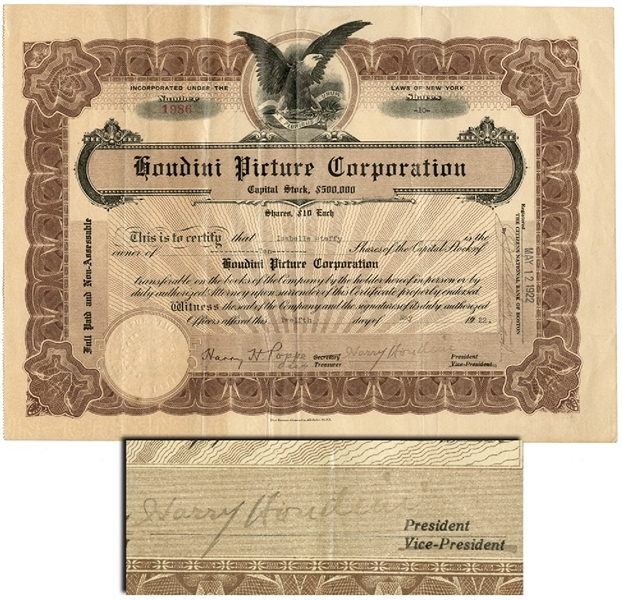 Stock Certificate signed “Harry Houdini” as President of the Houdini Picture Corporation, 8.25” x 11.5”. New York, May 12, 1922. Ornately bordered with blind embossed 1921 New York corporate seal in lower left. Houdini’s signature is darker than those usually found on stock certificates. Countersigned “Harry H. Poppe” as Assistant Treasurer. Folds, minor tape repairs on verso. Fine condition. Certificate Number 1986. In part, “This is to certify that Isabelle Steffy is the owner of Ten Shares of the Capital Stock of Houdini Picture Company …” Chartered by the State of New York on February 26, 1921, the Houdini Picture Corporation was involved in three Houdini silents: “The Soul of Bronze” (1921), “The Man from Beyond” (1922), and “Haldane of the Secret Service” (1923). Houdini’s company distributed the first two films; Houdini starred in the last two.